Alicia Keys hosted this year’s Grammy awards, and one of the first presenters she introduced to help her out? Well, it was the girl squad of actual dreams. To the internet’s sheer delight, Michelle Obama stepped out hand in hand with Lady Gaga, Jada Pinkett-Smith and Jennifer Lopez before the first few awards. The four joined Alicia to share positive messages of empowerment on stage. THE SPICE GIRLS ARE SHOOK. Look at this crew! This girl power! Lady Gaga! Jada Pinkett Smith! Alicia Keys! Michelle Obama! J-Lo! While each of the women talked about music and empowerment, it was Obama’s speech that was met with most rapturous applause. “Fom the Motown records I wore out on the South Side to the Who Run the World songs that fueled me through this last decade, music has always helped me tell my story, and I know that’s true for everybody here,” she proudly told those watching. helped me tell my story. Naturally, Twitter went absolutely crazy for the girl squad, asking what we are all thinking: HOW DO WE SIGN UP?! All hail Alicia Keys for getting these awesome women together for this moment! 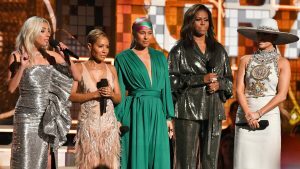 The post Michelle Obama’s Grammys’ girl squad just broke the internet appeared first on Marie Claire.